Viola…… I wiggled my nose………….. and tweaked my back……. Starting a tour in the far corner of the room is my treasured desk from from an auction at the University of Michigan…its huge, about 4 x 6, so when the drawers are fully extended the width of the desk is 8 feet. I hope my brother in law will make a couple repairs…a new Formica top and some trim. This desk is jam packed with an array of supplies. This is where I glue, paint, draw, hand stitch, etc, etc. Turning clockwise, in front of the desk is my big ol’ farm table with two huge drawers. Its on wheels, making it easily moved around within the room. 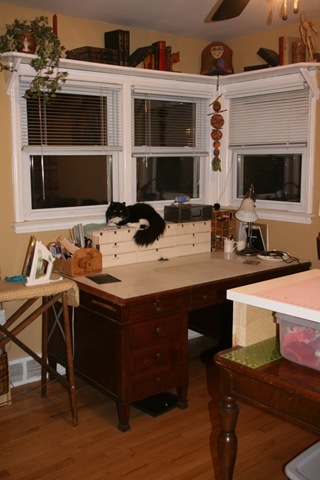 The sewing machine is just the right height for me, sitting on the tabletop. In front of the machine is the new cutting surface, a purchased tabletop from IKEA, Jeff added the legs to raise it up and keep it from sliding around. No more backaches when cutting fabric. My latest quilt in progress is hanging on the design wall….foam insulation covered with fabric. I had oak doors enclosing the design wall, but all they did is get in the way…..so off they came. I like that the sewing machine faces the window….lots of natural light and a view of the yard. Opposite the windows, is my rainbow of color! Doesn’t look like much, but goodness that is a lot of fabric. These are most of my cotton prints and solids. Other fabrics are stored in bins in the basement…there is room under the table for a bin or two when I need something different. 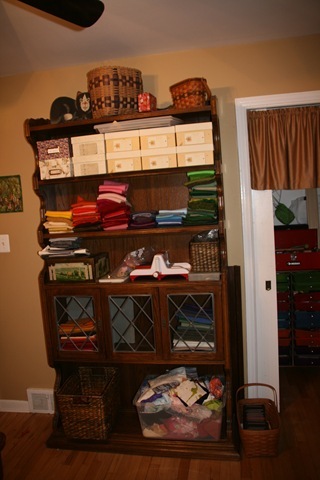 Between the entry door and the closet is an oak bookcase/cabinet, filled with wool felt, and my button collection. 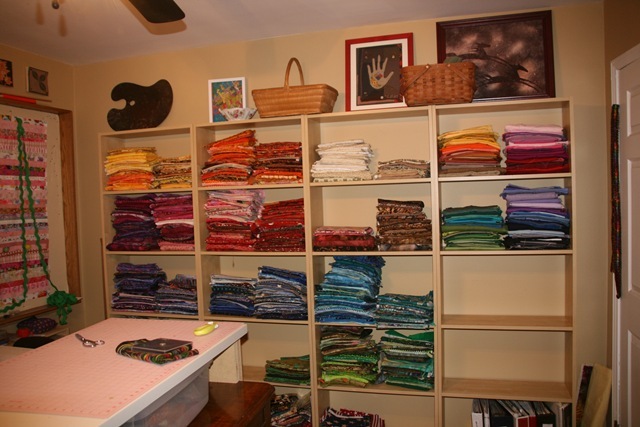 One of the nicest things about the reorganization is a dedicated place for a bin of fabric scraps….down on the lower shelf. Now we are back to the window wall, next to the desk. 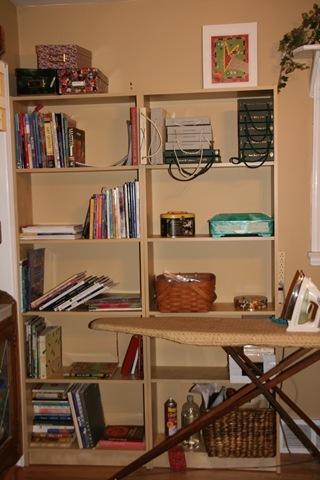 These are the last two shelves from IKEA….kind of nice to have a little empty shelf space. The tops of all the shelving and the walls contain artwork from friends, and objects that all have meaning and serve as my muses….some are worth their own blob post. 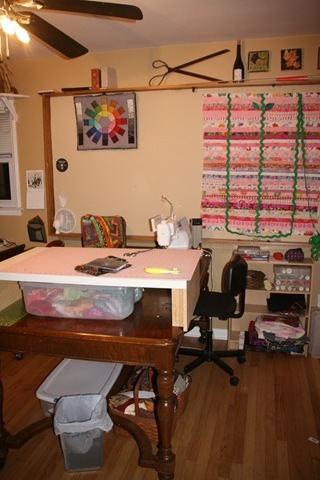 There you have it, my new sewing room….its truly a pleasure to get to work in there now. You are right CapriD …..it looks awesome and I am proud!! Will you pay me with extra hours in each day??? ?See u Saturday. LOVE, love, L.O.V.E. IT!!!! Love Bibsy too! Its about 11 x 14…yes its time to get back to counting up finished pieces Sandy. How big is your room? It looks really great. Now I want to see pictures of work in progress. Love the design wall. Wish I had enough wall space to have one. L0oks awesome Deb… toooooo neat though, it needs to look worked in! Oh, what a wonderful space! You are one lucky lady. May all you create in there bring you joy. I love the new look. You’ll get so much done in here.